Hi, I’m Brenda, welcome to my blog. 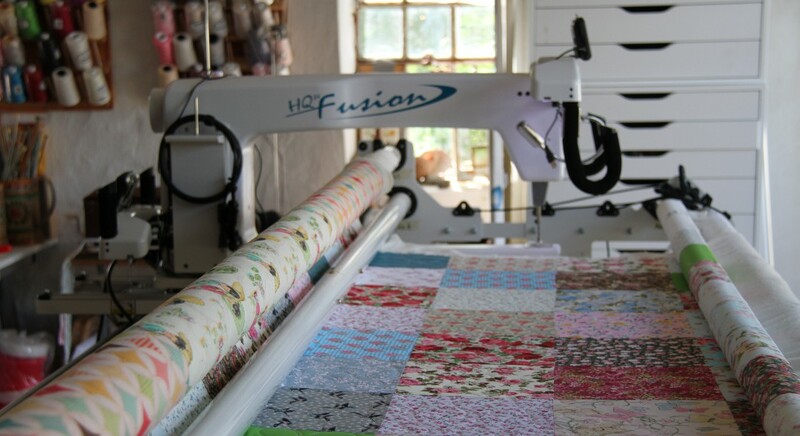 This blog is about Daisy, my amazing longarm quilting machine and our adventures in quilting. Daisy and I have been quilting together since the spring of 2013, before that I quilted on a mid – arm machine on a frame, while there was only 4″ of workspace on that machine I found that I loved this style of quilting and after a couple of years quilting for myself and many many costumers I took the plunge, raided my savings and got myself a longarm machine, my chosen machine is the Handi Quilter Fusion 24 a lovely machine with a full 18″ of working space! I moved to Denmark from England in April 2014, (I have been working with my husband Peter renovating a 1750 cottage, you can read more about these adventures in my other blog, urbangirlcountryliving.wordpress.com.) Here I have set up a super studio for Daisy and I to work in, its light and airy and full of inspiration and we are called Daisy Quilts for you! I have been kept busy quilting for costumers from around Europe I even have one quilt that went to the USA. As well as longarm quilting I take commissions for quilts for artist, designers who use my quilts for photos shoots and displays. I also do a selection of baby quilts for sale and often get requests for college quilts. I hope you enjoy reading about our quilting adventure and will add to this as the adventure grows. If you need your quilt quilted, do contact me at the following email or telephone number. Absolutely stunning quilt Brenda! Would love to see the Kaffe Fasset backing too…. Please! I will take a photo and post it shortly, welcome Julia.